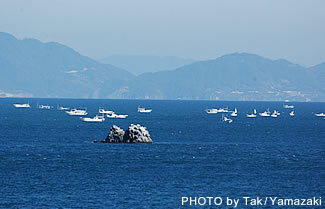 There are many different kinds of fish in the Seto Inland Sea and the fishery has always been outstanding, making the life of the people here very rich and happy. No wonder fishing is one of the most fun and popular activities here. 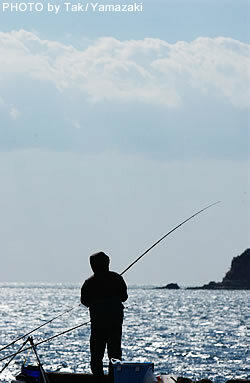 Japanese fishing doesn't lend itself to sports fishing, as is the case overseas. Therefore, it's very common to catch certain fish depending on the season. As you can see, there are a lot of different kinds of fish depending on the season and there also different ways of catching each fish, so it may be a good idea to ask the locals or people who work at fishing shops. You can eat almost all kinds of fish you catch, so why don't you ask the hotel staff about the best way to cook the fish you catch. It's also possible to go out to sea by ship and catch fish or experience dragnet fishing. Some islands let you rent fishing equipment. There aren't many restrictions on fishing, but you are can't fish near fishfarms or protected areas. Also there are some poisonous fish (blowfish, "manju" crab, jelly-fish) and some fish which sting (Okoze), so you need to be very careful. Fishing while scuba-diving is prohibited in all areas, but you are allowed to dig for clams off almost all beaches.